GENKAKU-AGAIN (adam fisher): may we paddle your kids? 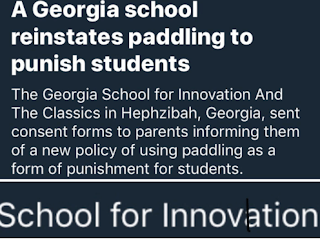 The Georgia School for Innovation and the Classics is based in the biblically named-town of Hephzibah, and promises to teach students using the Socratic method. But those aren’t the only ways it likes to invoke a sense of antiquity. This week the school sent letters home telling parents they wanted to reintroduce corporal punishment for students, and asking for their consent to have their children struck with a paddle if they misbehave. It was part of my youth, but my parents understood restraint and put more into it than just the whipping. I did prefer it to being grounded as it allowed me to get it over with and move on with my immediate plans of getting away with something. But dog trainers, who have to be effective, never hit their dogs as it interferes with the dogs education. But I doubt a dog trainer would try to teach 30 dogs at a time either. Not that I’d send my kids to such a school.